Peterson AFB traces its roots to the Colorado Springs Army Air Base, established on 6 May 1942 at the Colorado Springs Municipal Airport which had been in operation since 1926. The base carried out photo reconnaissance training under the auspices of the Photo Reconnaissance Operational Training Unit (PROTU). On 22 June 1942 Colorado Springs Army Air Base was assigned to the 2d Air Force, headquartered at Fort George Wright, Washington. Then, after only a few weeks, a tragedy occurred that would indelibly affect the base. On 8 August 1942, First Lieutenant Edward J. Peterson, Operations Officer for the 14th Photo Reconnaissance Squadron and a native of Colorado, crashed while attempting to take off from the airfield when the left engine of his twin engine F4 (a reconnaissance variant of the P-38 Lightning) failed. A base fire department crew rescued Lt. Peterson from the burning wreckage. Unfortunately, Lt. Peterson sustained significant burns and died at a local hospital that afternoon, thereby becoming the first Coloradan killed in a flying accident at the airfield. Consequently, on 13 December 1942, officials changed the name of the Colorado Springs Army Air Base to Peterson Army Air Base in honor of the fallen airman. The base assumed a new mission in the spring of 1943, that of heavy bomber combat crew training. The 214th Combat Crew Training School conducted the training, utilizing the B-24 Liberator. From 5 March to 1 October 1943, "Peterson Field" as the base was commonly called, was assigned to the 3d Air Force, headquartered at Greenville Army Air Base, South Carolina. Control of Peterson Field then reverted to the 2d Air Force. In June 1944 the mission at the base once again changed, this time to fighter pilot training. The 72d Fighter Wing, assigned to the base, employed P-40 Warhawks to carry out this mission. In April 1945, Peterson Field was assigned to Continental Air Forces. The location of the Army Air Forces Instructors School at the base signaled another mission change. A short time later, on 31 December 1945, the Army inactivated the base, turning the property over to the City of Colorado Springs. 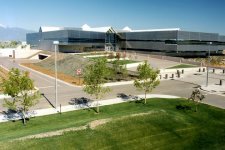 The legacy of Peterson Field and the military presence in Colorado Springs took a significant turn in September 1947, following the birth of the United States Air Force. Soon after its inception, the fledgling service twice reactivated the base, from 29 September 1947 to 15 January 1948 and again from 22 September 1948 into 1949. 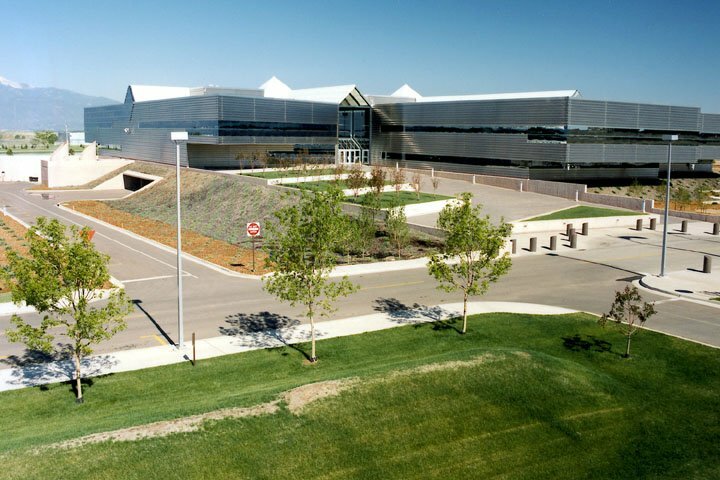 During the latter period, the base served as an airfield for Headquarters, 15th Air Force which had been temporarily located in Colorado Springs. Peterson Field inactivated again when 15th Air Force moved to March Air Force Base in 1949. 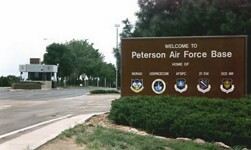 The Air Force activated Peterson Field once more, following the January 1951 establishment of Air Defense Command at Ent AFB, located in downtown Colorado Springs. The 4600th Air Base Group activated simultaneously on 1 January 1951 and provided support for the newly established command. In 1958 the 4600th achieved wing status and was designated as the 4600th Air Base Wing. Subsequently, on 1 April 1975, the Air Force redesignated the wing as the 46th Aerospace Defense Wing. One year later, on 1 March 1976, Peterson Field was renamed Peterson Air Force Base. Strategic Air Command assumed control of the base on 1 October 1979. Then, on 1 September 1982, USAF officials activated Air Force Space Command at Peterson, followed by the activation of the 1st Space Wing on 1 January 1983. Peterson Air Force Base became the hub of Air Forces space activity when the 1st Space Wing assumed host unit responsibility following the inactivation of the 46th Aerospace Defense Wing on 1 April 1983. The 1st Space Wing then transferred host unit responsibility to the 3d Space Support Wing which activated on 15 October 1986. Finally, on 15 May 1992, these two wings inactivated and their personnel and equipment transferred to the 21st Space Wing which activated on 15 May 1992. Secretary of Defense Recommendation: In its 2005 BRAC Recommendations, DoD recommended to realign Dyess AFB, TX. The C-130 aircraft assigned to the 317th Airlift Group would be distributed to the 302d Airlift Wing (AFR), Peterson AFB, CO (four aircraft) and 2 other installations. Peterson AFB would have an active duty/Air Force Reserve association in the C-130 mission. The C-130s at Dyess would be distributed to Peterson (30-airlift) to facilitate active duty associations with the Guard and Reserve units. Commission Findings: There were no findings specifically pertaining to Peterson AFB.